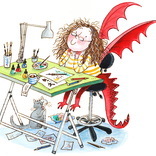 I have been an illustrator for almost 30 years, producing work for publishers in the UK, USA and Canada. I work traditionally in pen and ink, occasionally water colour and pencil. Clients include Bloomsbury UK, Bloomsbury USA, Andersen Press, Egmont, Orion Books, Gomer Press, Scholastic Can. OUP. Based in North Wales.